It was certainly never my intention to break new ground in the world of feminine hygiene marketing, and the attention that the work received came as a bit of a shock. However, now that I have the distinction of being the first person to ever put blood on a femcare product ad (for Always, pictured above), I thought I'd take a moment to explain my original idea and how the ad came to be. You might already be familiar with the above image. 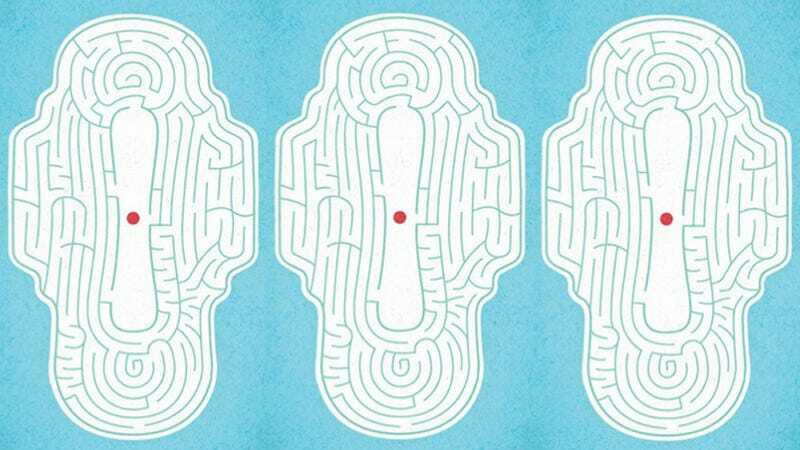 It made the rounds on the internet earlier this year for being the first feminine hygiene ad to ever feature blood. A number of websites wrote that the ad had broken "a long-standing taboo," and others went so far as to call it a "historic moment." I had actually made this ad while working at Leo Burnett last year, and in fact, it is the only ad I managed to get produced during my brief tenure in advertising. I was an intern in the global marketing department at Leo Burnett in Chicago when I thought it might be fun to switch over to the creative department. However, I was told, I would need a portfolio of spec ads before anyone will allow me make real ones. No problem, I thought. Now, it is known within the advertising industry that tampons and sanitary pads are notoriously difficult to market. While beer and running shoes lend themselves naturally to clever and funny marketing campaigns, the femcare category is filled with euphemisms and social taboos. Being the naive intern I was back then, I decided I'd tackle the category and make an ad for Always, who happened to be one of Leo Burnett's clients. Knowing little about feminine hygiene, I had to first conduct focus groups, which basically just consisted of me asking a few female friends a bunch of questions about the topic over coffee. I quickly learned that one of the most frustrating aspects of femcare ads is that they all make such a big ordeal out of having one's period. It's not enough that they act like they're selling a lifestyle, they have to try to be your best friend as well. I wanted none of that in my work. There was going to be no white spandex and no blue liquid. Just a simple, clear message: the product works. Nothing more, nothing less. Since I was working alone without a copywriter, I decided that there was going to be no copy, and the ad would be purely visual. After a short brainstorm session, I came up with the idea of showing the pad trapping a red dot. The maze idea came first, and then I added two others to make it a campaign. I chose the minimalist art direction in keeping with the simple and direct message. Regarding the red dot, the prime culprit of the kerfuffle, I had not intended for it to represent a drop of blood. It was chosen as a symbol to represent the concept of the period as a whole, and also as it was a visual pun on the grammatical period. It just seemed to make the most sense in the context of the ad. I imagined that could eventually be developed into a series of posters, all with the same color scheme and the outline of the pad, but with variations of the idea of trapping the red dot. I was secretly hoping that one day these would become as iconic as the Absolut ads. To make a long story short, I showed the maze ad to a couple of people around the agency, and eventually it caught the attention of Mark Tutssel, the worldwide Chief Creative Officer, who liked it so much that he decided to have it get it published. At this point, the ads were handed over to the actual Always team, the client was brought in, and I no longer had full control. Always Infinity was replaced by Always Ultra Thin ( the leak guard selling point was being promoted at the time, and the creative directors felt the maze was more in line with this idea). The big question though, was where to put the red dot. I had placed it at the top in my original concept simply because I was following the normal maze conventions. I had even designed the maze so that it was easy to see that it had to end in the middle. However, it was felt that with the red dot at the top, the ad might be wrongly interpreted to imply that the dot had "escaped" from the pad, and so it was moved to the middle, where it was much safer. When the ad came out, some people pointed out that it looked like a soiled pad – I'm not sure if this occurred to anybody in the team. It certainly hadn't crossed my mind. This post originally appeared on WillyChyr.com. Republished with permission.